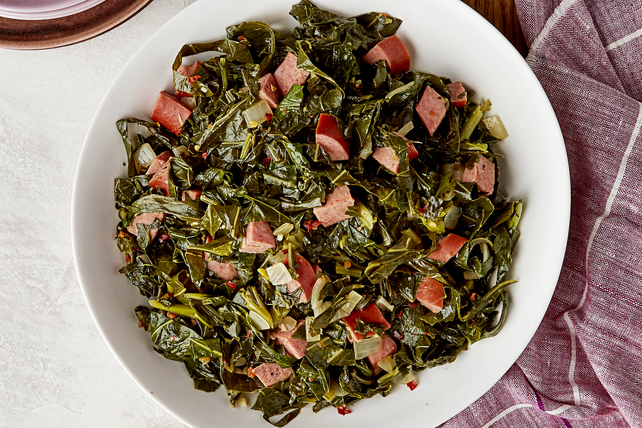 Go green with a plate of Collard Greens with Sausage & Onions. Garlic and tomato vinaigrette dressing add flavour to this simple collard greens with sausage dish. Wash collard greens, taking care to remove all grit. Remove and discard hard stems. Roll up greens in small bunches; cut crosswise into thin strips. Heat dressing in Dutch oven or small stockpot on medium heat. Add sausage, onions, garlic and crushed pepper; stir. Cook 4 to 5 min. or until onions are softened, stirring frequently. Stir in broth. Add collard greens; stir. Simmer on medium-low heat 25 to 30 min. or until greens are tender, stirring occasionally. Stir in vinegar; cook 5 min., stirring occasionally. Substitute stemmed fresh kale for the collard greens.